At present, diseases resulting from various reasons have been causing deadly fears to humans and previously incogitable losses to health. Meanwhile, the patient compliance has been weakening because of drug resistance and serious drug adverse effects. There is therefore an urgent need for the development of novel structural agents. Rhodanine derivatives have exhibited wide biological activities, as well as significant industrial applications, which suggests that rhodanine heterocycle represents a key structural motif in heterocyclic chemistry and occupies a prominent position in drug discovery. Here, we review some deadly defects of clinical medicines to the therapy of diseases and important advances on rhodanine derivatives in drug researches (e.g. 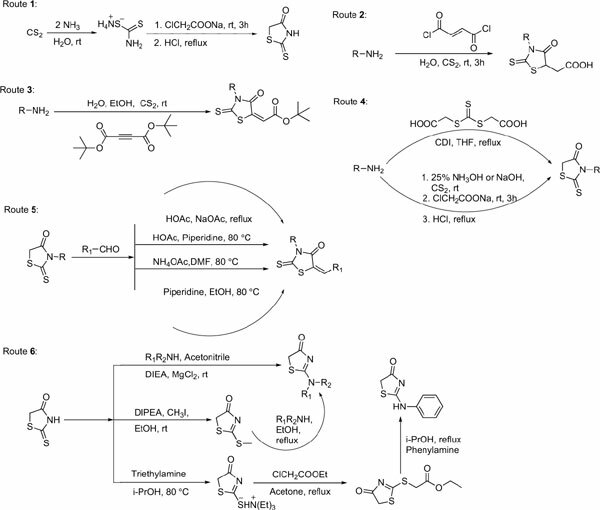 as anti-diabetic, anti-viral, antiinflammatory, anti-microbial, anti-tumor agents and inhibitors for Alzheimer Disease), indicating that rhodanine heterocycle could be used as a significant pharmacophore to develop novel pharmacological active molecules. It is believed that the review is of importance for new ideas in the development of and rational designs of rhodanine-based drugs. Adverse effect, bioactivity, drug resistance, rhodanine, pharmacophore, pharmacological active molecule.